Kelly Swanson – Thanks everyone for calling in for the Manny Pacquiao vs Adrien Broner media conference call for their fight on January 19 live on SHOWTIME PPV® from the MGM Grand Garden Arena in Las Vegas. I’m more than happy to introduce Leonard Ellerbe, Chief Executive Officer of Mayweather Promotions to begin our call. Leonard? Thank you Kelly. I would like to thank everyone for joining the call today. We’re nine days away from what I consider to be the biggest fight of 2019. These fighters are fresh off of two outstanding media day workouts yesterday in California. Both guys seem very focused. They are both in great shape. We have an unbelievable fight coming next Saturday night. We’re really looking forward to it. At this time, I would like to introduce Stephen Espinoza, President of Sports and Event Programming for Showtime Networks Inc. Stephen? Thanks Kelly and thanks Leonard. Look, all of you guys are very well-acquainted with Manny and Adrien, you’ve covered them for years. They’re two of the biggest names in the sport so I don’t need to tell you anything more about them. What I will do is give you some brief programming updates. Episode 2 of “ALL ACCESS” premieres this Friday 9:30 ET/PT on SHOWTIME. That is immediately before ShoBox, which is a three-fight card headlined by Devin Haney. Then, once we get into fight week — as has become our hallmark — we will be distributing a whole variety of premium content across social media platforms, on SHOWTIME and elsewhere. We’ve got the four installments of “ALL ACCESS DAILY.” That’s a daily digital series throughout fight week on YouTube and Facebook. We’ve got a daily series created specifically for Snapchat that is going to start even earlier than Fight Week. We’ll also have livestream coverage of the Wednesday press conference, the Thursday press conference, the Friday weigh-in, as well as the Countdown Live pre-fight show. So, as we get into these last nine days before the event, there is a variety of content available to satisfy every boxing fan’s need. 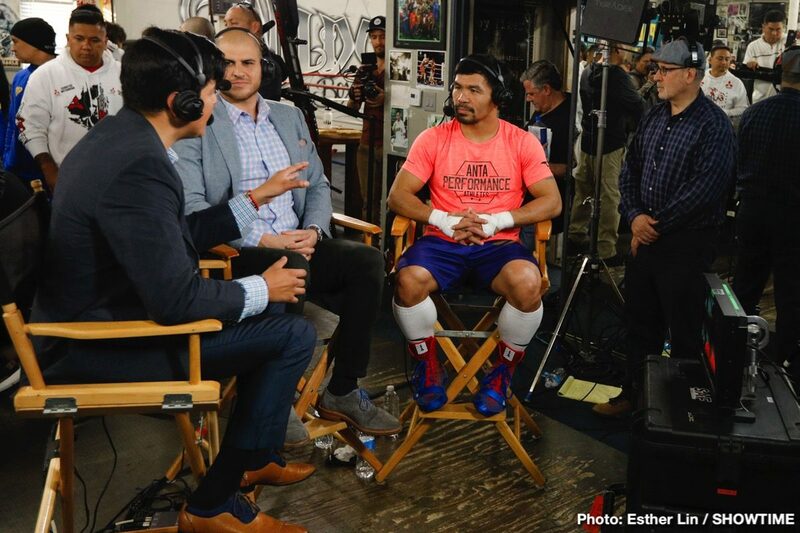 Both SHOWTIME subscribers and non-subscribers alike can purchase and live stream this event directly through the SHOWTIME app on a variety of platforms — plus, of course on traditional pay-per-view distributors — making this event available virtually everywhere and anywhere sports fans want to consume their content. Now we’re going to hear from Manny Pacquiao and to introduce Manny Pacquiao we have Fred Sternburg. Fred? Thanks Kelly. Well, I think Stephen said it best, “No introduction needed for boxing’s only eight-division World Champion and the reigning Fighter of the Decade.” So, let me present to you Manny Pacquiao.